Letter from Dr. John F. Busch advising Miss Berry that Miss Peggy Nell Holliday's application has been accepted by the State Tuberculosis Sanitorium and that she is number eight on the waiting list for treatment. Dr. John F. Busch M.D. 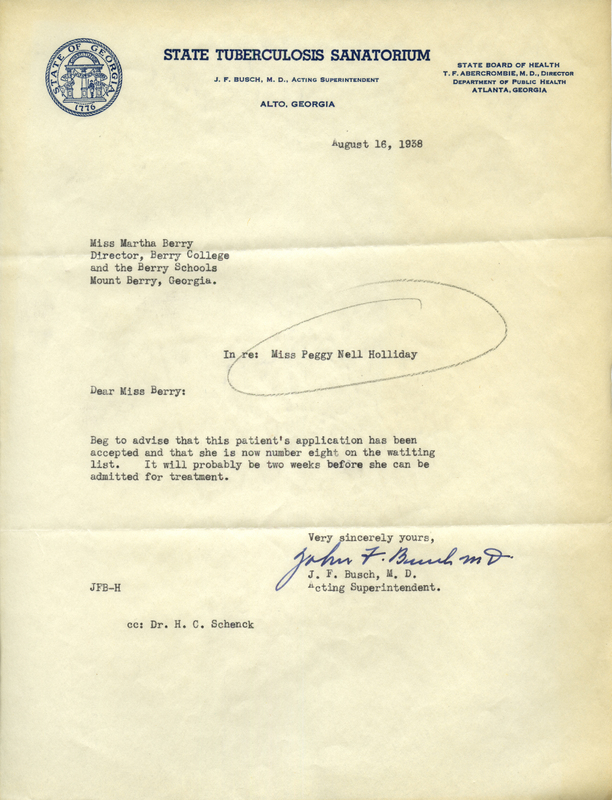 Dr. John F. Busch M.D., “Letter to Miss Martha Berry from Dr. John F. Busch, Acting Superintendent of the State Tuberculosis Sanatorium.” Martha Berry Digital Archive. Eds. Schlitz, Stephanie A., Jessica Hornbuckle, Matthew LaFlash, et al. Mount Berry: Berry College, 2016. accessed April 21, 2019, https://mbda.berry.edu/items/show/14590.